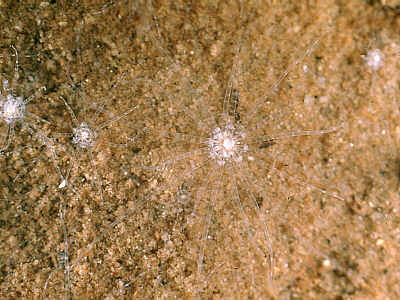 Description: A tiny worm-like anemone up to 40mm long and 2mm diameter, usually about 15mm x 1mm. Up to 16 very long (relative to disc size) tentacles. Transparent, more or less patterned with white as in illustration. Habitat: Habitat similar to Edwardsia ivelli, Nematostella vectensis may be very abundant if present. Distribution: Known from several southern counties: Dorset, Hampshire, Sussex, Suffolk and Norfolk, although it has become extinct in several localities as a result of loss of habitat and pollution. Also known from North America (both coasts) and from Canada. Similar Species: Compare with Edwardsia ivelli. Very small size. Habitat in saline lagoons, etc. Picton, B.E. & Morrow, C.C. (2016). Nematostella vectensis Stephenson, 1935. [In] Encyclopedia of Marine Life of Britain and Ireland.